Tymon Mellor: Following the Second World War, burial of the dead was a significant issue within the Territory as the graveyards were filling up. 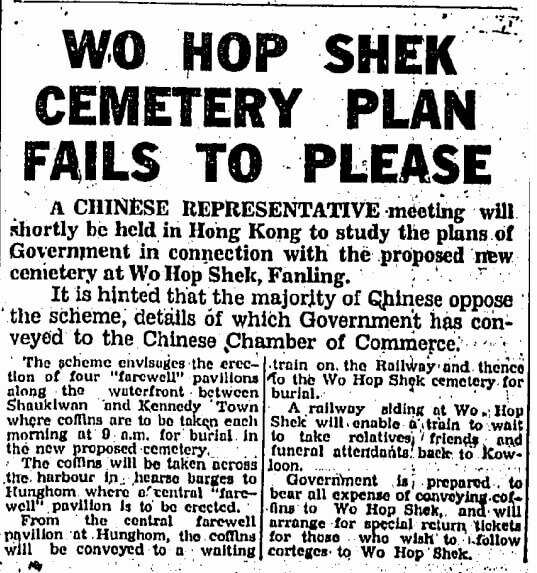 In the early 1940’s the Government proposed developing a new public cemetery at Wo Hop Shek, north of Tai Po served by a spur line from the Kowloon Canton Railway. 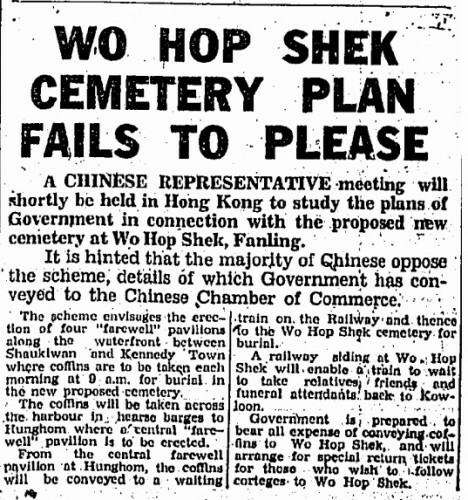 The local community had reservations about the scheme, as can be seen from the report in the Hong Kong Sunday Herald, 29th September, 1940. 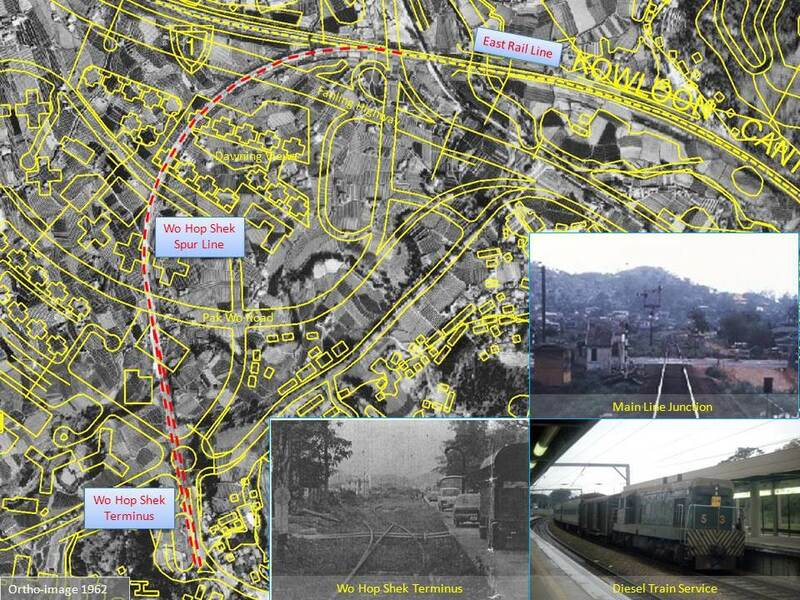 By the end of the decade, the spur line and Wo Hop Shek terminus had been constructed, allowing a rail service to commence on the 15th October, 1949. The train services carried bodies to the cemetery and crematorium, along with relatives and friends. Additional train services were provided during the Ching Ming and Chung Yeung Festival. As with the rest of the KCR, the line was not electrified and the trains were pulled by diesel locomotives. With the electrification and double tracking of the KCR, along with the construction of the Fanling Highway and the new Fanling town, the line was closed in April, 1983 after the Ching Ming Festival and a bus services provided. The abandoned spur line following the double tracking of the East Rail Line. 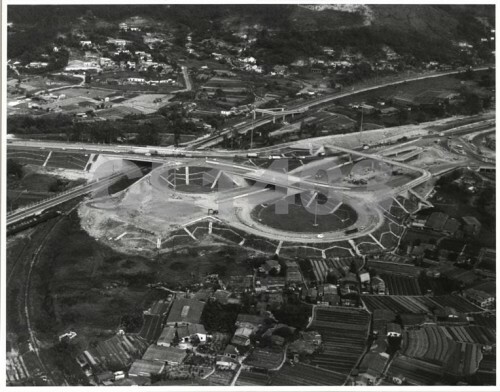 The alignment of the spur was lost to the new town development, as shown on the plan below. This article was first published on 17th February 2014. I remember driving along the old Tai Po Road in the early to mid eighties, and seeing a number of the old KCR green passenger carriages being burnt as the electrification of the line was underway. It seemed such a waste. I didn’t get close, but I’m sure there were all sorts of parts on the train such as seats, doors and window frames that would be highly collectible today. I’m guessing door handles and luggage racks were just sent for scrap too. As you say it all seems such a shame. Do you know why the stock was being burnt at that location, it seems somewhat out of the way? As is often the case objects become valuable both as pieces of history and financially only with the passing of time. 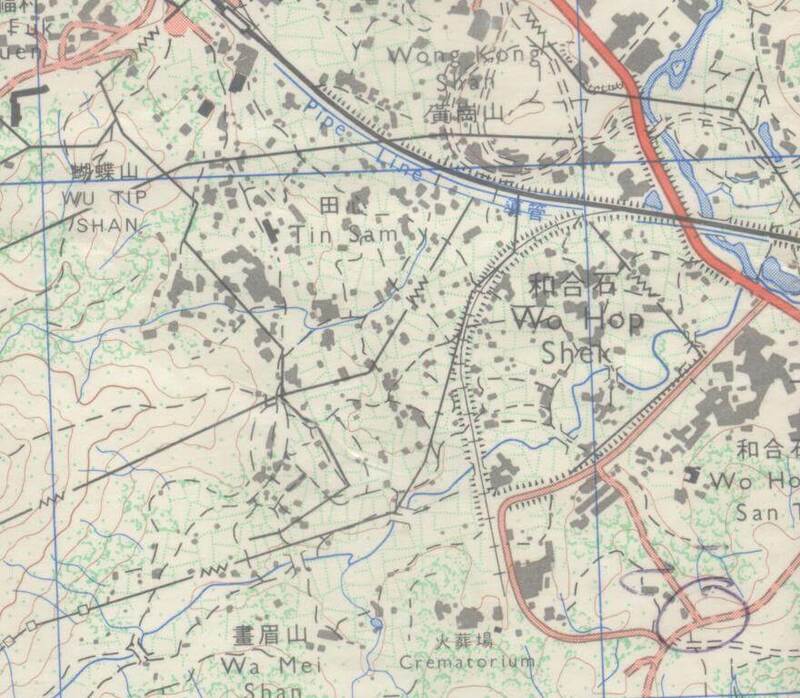 I work near Wo Hop Shek and wish to know more about this historic and mysterious branch. In fact, I found there is an old bench nearby which look like the one used in the old compartments. How can I share the photo with you guys?